With Bill4Time’s email tracking feature, whenever an email is opened, clicked upon, or failed to deliver – you’ll know! Now you can tell exactly when your client has opened their invoices, leaving you better prepared should you need to follow up on an outstanding bill. Sent – This status indicates that an email was sent out of the program successfully. Rejected – This status indicates the recipient’s address is no longer valid, may be having temporary issues, or does not wish to receive these emails. Delayed – This status indicates that the mail system attempted to deliver the email, but was unsuccessful and will try again soon. Marked Spam – This status indicates the recipient address registers a spam complaint for the email sent. The recipient may not have seen this email, as some inboxes automatically filter spam. Opened – This status indicates the email was successfully delivered and was viewed by the recipient. 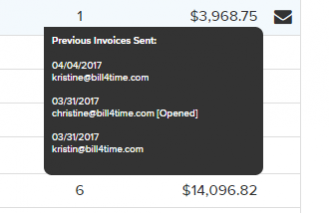 Another way to access this feature is to hover over the invoice email icon to view the Email History popup for an invoice. An Important Note About Open Tracking: Tracking e-mail opens is done using an image technique that is not 100% reliable. We can tell when an e-mail is opened because of a tiny invisible image that is included in the e-mail; when the image is loaded, Bill4Time is notified. However, if your customer’s e-mail client does not load images automatically (which some don’t), Bill4Time will not be able to tell if the Invoice has been opened or not. In other words, an “Opened” label guarantees that the e-mail was in fact opened, but the absence of an “Opened” label does not necessarily mean the e-mail was not opened.